With Wallace & Gromit's Grand Adventures, Telltale has developed a new control scheme so that they can give the characters a more cinematic style of framing, in order to better capture the feel of Aardman Animation's Wallace & Gromit films. Instead of just pointing and clicking with the mouse, the characters now have direct movement. Telltale has given users three options to play the game on the PC. The default option is using a keyboard and mouse. The arrow keys (or WASD) on the keyboard controls the character, and the mouse selects a hotspot. The next option is to use just the keyboard, and play similar to how LucasArts' last two adventure games, Grim Fandango and Escape from Monkey Island, played. It can also be played using a gamepad. Gamers play as both Wallace & Gromit alternately throughout the games. 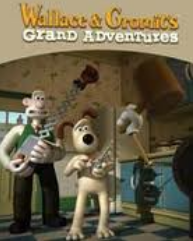 Just like in the films, each game sees Wallace start up a new business venture with one of his wacky new inventions, that ultimately ends up in disaster, with his loyal dog Gromit having to inevitably save the day. Only the second episode was released for iPad, but like the other digital versions of the game, it is no longer available. In January 2014, Telltale released a statement stating that their contract with Aardman expired, and they pulled the game from digital download services as they no longer had the right to sell the game. However, since it was also released through retail for Windows, you can still purchase this version on Amazon. Wallace & Gromit start a honey selling business called "From Bee To You". Wallace & Gromit open a home beach resort called "Wallaby Street Water World" in their basement. Monty Muzzle organizes a fundraiser for the local dog shelter, but Gromit realizes he has other intentions. Wallace is invited to golf club Prickly Thicket, but a dispute threatens to ruin his West Wallaby Street lifestyle.